My head is still buzzing from the ride on the KTM RC 200 and not just because the KTMs are a bunch of fun motorcycles, but more on that later. The RC 200 features the same engine as the 200 Duke with no changes to any of the mechanicals. Like the 390s, it too features the same characteristics that distinguish the RC from the Duke, namely a taller, more steeply raked rear sub frame and a steeper steering angle in addition to the full fairing and flat bars. The all-black full fairing also makes it look more menacing than the black and white RC. With the frame and fairing adding eight kilos to the package but giving it better aerodynamics, the performance has changed but not by much. Off the line to 60kmph the Duke leads by a good 0.26 of a second, but the RC regains some ground once the aero advantage kicks in, crossing the 100kmph mark in 9.89 seconds, just 0.03 of a second off the Duke and just 0.66 of a second slower than the torquey CBR250R. Fuel economy too is a very similar - 29.85kmpl in the combined city and highway cycle. With so few changes you could be forgiven for thinking that the story ends here but it's the lovely tractability of the quick revving 200cc engine that makes the RC 200 a crazy amount of fun. The moment you set off, that revving nature makes you just want to wring every bit of performance out of the engine and the even sweeter handling chassis. The riding position is comfortable and committed which further eggs you on and this combination soon had me, quite uncharacteristically, I must add, carving up roads like an absolute madman. Through corners too despite lesser power than the RC 390, the sharper steering and awesome chassis mean you can really push the bike to its limits and this is what's left my head still spinning two days later. 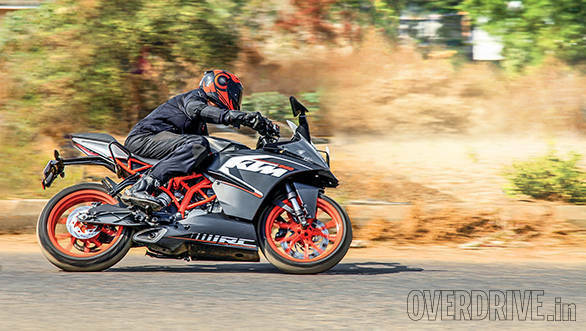 At Rs 1.84 lakh on-road Pune, the KTM RC 200 is really a great all around package, one that works on the streets and the highway and is still perfectly at home on the track.